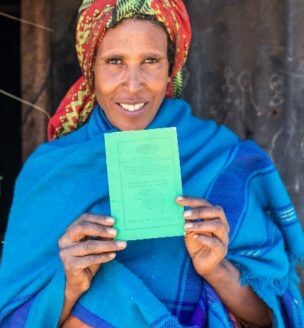 In the late 1990s the Government of Ethiopia began to register and certify the land use rights of rural households in order to increase their tenure security. Generally viewed as a positive effort, “first-level” certification had some limitations (e.g., it did not map individual plots or support a computerized land registry). To address these and other concerns, USAID supported two programs to provide “second-level” certification to Ethiopian households: the Ethiopia Land Tenure Administration Program (ELTAP) (2005-08) and the Ethiopia Land Administration Program (ELAP) (2008-12). The main goal of the ELTAP project was to help the government develop a land certification system that more accurately defined and computerized the land use rights of households in the states of Amhara, Oromia, SNNP, and Tigray. The main goals of the ELAP project were to strengthen the legal framework on land administration, promote tenure security to enhance land investment in high potential areas, increase public information and awareness and strengthen the capacity of land administration institutions. USAID designed and implemented the endline component of a Difference-in-Difference impact evaluation that was coupled with entropy weighting to strengthen comparability between the treatment and comparison groups. The evaluation estimates the impacts of second-level certification relative to first-level certification on household beneficiaries in terms of access to credit; land disputes; land rental activity; soil and water conservation investments; land tenure security and female empowerment and decision-making related to land. These impacts are estimated from a panel data set of 4,319 households, surveyed across 284 kebeles (village clusters). Surveys were conducted at the start of second-level certification and again 3-7 years afterwards. This evaluation also examines the varying impacts of second-level certification based upon household or village characteristics, including gender of head of household, marital status of head of household, age of head of household, total household landholdings, wealth status, distance to regional capital, and program round (i.e., ELTAP v. ELAP). Importantly, this evaluation attempts to mitigate limitations of earlier data collection and the potential influence of program targeting on estimates of the program’s impact. An Endline Report, Design Report and other materials have been drafted and are available on this page. Households with second-level certification have a 44% increase in a wife deciding which crops to grow on lands under her control.